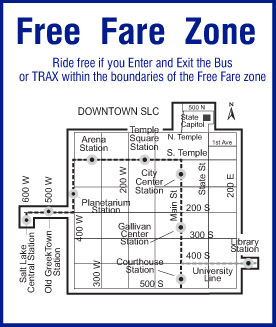 Many Utahns who live outside of downtown Salt Lake City may be surprised to find out that there is an entire section of the downtown area where bus and TRAX travel is completely free. The next time you want to come to downtown Salt Lake City, consider taking the FrontRunner from your area to downtown. Then utilize the free fare zone to get where you need to go. Learn more on the UTA website. Originally published by Good4Utah on February 5, 2017. 2/5/2018 – SALT LAKE CITY, UT – The Salt Lake Chamber and its clean air partners kick off the 9th Annual Clear the Air Challenge. The Challenge, issued by business, government and community leaders, is a month-long competition designed to encourage Utahns to reduce their vehicle emissions by choosing alternatives to driving alone. Kimberly Flores, Director of Public Relations and Communication for the Salt Lake Chamber shared the main goal of the challenge and how we can all individually be responsible. And for the first time, the Clear the Air Challenge will be held during the month of February, when our air quality is visibly at its worst. “As a Certified Eco-Friendly Subaru retailer in our beautiful state, we take environmental sustainability very seriously,” said Jeff Miller, General Manager of Mark Miller Subaru. “It’s during days of poor air-quality that I ask myself, my team, and members of our community, ‘What can we do differently?’ While it seems antithetical for a car dealer to suggest public transportation, biking and other alternatives to driving, our way of life and the air we breathe far exceeds all else. Our team at Mark Miller Subaru is looking forward to participating in the Clear the Air Challenge to make steps in improving Utah’s air quality”. The Clear the Air Challenge, issued by business, government and community leaders, is a month-long competition starting February 1st, that gives you the chance to reduce your vehicle emissions by choosing alternatives to driving alone. The Clear the Air Challenge is a partnership between TravelWise, UCAIR, Penna Powers and the Salt Lake Chamber. Originally published by Good4Utah on February 1, 2018. Today kicks off the 9th Annual Clear the Air Challenge. The goal for the movement is simple: clean up Utah’s dirty air. Lara Fritts, Director of the Salt Lake Department of Economic Development, and Vicki Bennett, the city’s Director of Sustainability, joined Brian Carlson to talk about how it works. The Challenge is a month-long competition designed to encourage Utahns to reduce their vehicle emissions by choosing alternatives to driving alone. For the first time, the Clear the Air Challenge will be held during the month of February, when our air quality is visibly at its worst. In order to do this, at least 10,000 Utahns will need to engage and register at ClearTheAirChallenge.org. Clear the Air Challenge is a great event, because it creates a coordinated framework to show Utahns how easy it is to make difference. Visit the website to see the impact and get stats of last year’s challenge. Fidelity Investments in downtown SLC won last year’s team competition, followed closely by University of Utah and L3 Technologies. Fidelity’s team efforts alone prevented 492 tons of emissions from entering the air last year. When you register at ClearTheAirChallenge.org, it’s quick and easy to create or join a team. Teams can be anything: companies, departments, neighbors, or friends. Salt Lake City Economic Development has challenged the city’s Finance Department this year. In fact, every city department is getting involved. All 3000 of the city’s staff members are encouraged to participate in the challenge. Fritts and Bennett say it starts from the top, usually with your company’s CEO recognizing it’s importance. A good place to start planning your commute and finding options can start with the Travel Wise Tracker. It’s a free, easy tool you are able to use anytime. Simply find your route, then enter beginning and ending destination. It will show you all of the alternatives to driving your car. It will even show you carpools that are available. Doing our part to clear the air isn’t just about our quality of life, it’s also an economic issue. In order to attract and retain the kind of talent needed to further our state’s economy, we have to protect our unparalleled quality of life, and they say this is everyone’s responsibility. There are no perfect answers but there are practical solutions. The Clear the Air Challenge shows us that small individual changes can, and do, make a difference to Utah’s air quality. Visit ClearTheAirChallenge.org now to join and make a difference.